A step-by-step guide on how to use and interpret phase diagrams. Whether used as a textbook or a reference source, this book is the most thorough and complete tool available for users of phase information. 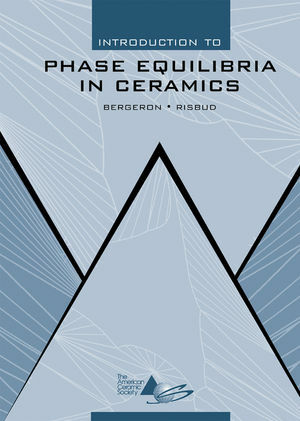 Clifton G. Bergeron and Subash H. Risbud are the authors of Introduction to Phase Equilibria in Ceramics, published by Wiley. The Titania and Zirconia Systems. Structural Consideration of Liquid Immiscibility. Determination of Phase Equilibria Diagrams. Hypothetical Binary Systems, Phase Analysis. Isoplethal Studies in Ternary Systems. System with a Binary Compound Melting Incongruently. Peritectic and Eutectic Reactions during Cooling. Composition on an Alkemade Line. Decomposition of a Binary Compound Having a Phase Field in the Ternary System. Ternary System with Two Solid-Solution Phases. Suppression of an Intermediate Compound. Glass Formation and Transformation Curves. Melting Points of Metal Oxides.